Planning application for £3billion plant lodged with Scottish Government. A full planning application for a £3billion coal-fired power station at Hunterston in Ayrshire has been lodged with the Scottish Government. Ayrshire Power wants to build a plant with experimental carbon capture and storage (CSS) technology. 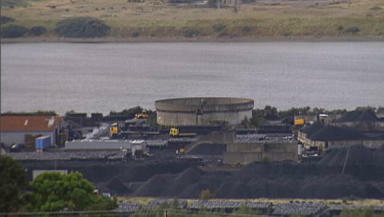 If approved, it will be the first coal-fired power station to be built since the 1970s. The planned facility would be the first of its kind in the UK. Project director Muir Miller said: "We are pleased that our application has now progressed to the next stage of the planning process. "We believe our proposal supports the UK and Scottish governments' commitment to leading the way in developing CCS to assist in de-carbonising the UK's electricity sector by 2030." The development is earmarked for a site between the existing Clydeport coal handling depot at the Hunterston terminal and Hunterston B nuclear power plant. It would burn coal and "biomass" fuel with "strict emissions control", the firm said. Environmentalists and locals have opposed the plan arguing it makes a mockery of the government's commitment to reducing carbon emissions. 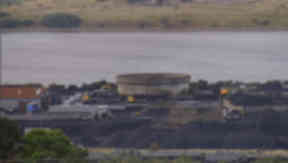 Green party co-leader Patrick Harvie MSP said: "The era of new coal-fired power stations is over, and this plant must never be permitted to go ahead. "It's incompatible with building a green and successful economy. It was explicitly rejected by the Scottish Parliament in March this year, and one half of the joint venture has already left the sinking ship. "A new coal-fired power station would inevitably mean new opencast coal here in Scotland or dirty coal imports from overseas." Juliet Swann, Friends of the Earth Scotland head of campaigns, said: "We are also extremely concerned that Ayrshire Power plan to import coal from Colombia. Friends of the Earth Colombia has reported that mining operations there pollute water supplies, devastate agricultural land and cause communities to be displaced." Dr Dan Barlow, head of policy at WWF Scotland, said: "We are disappointed Ayrshire Power has formally applied to build the damaging and superfluous coal power station at Hunterston. "The proposal is set to capture only a fraction of the plant's climate emissions at the outset and would seriously undermine Scottish Government commitments to largely de-carbonise the power sector." In March, MSPs backed the Green party in a 66-26 vote urging ministers to reject the application. The vote added to concerns that the carbon capture and storage technology, which removes CO2 emissions and pipes the gas underground, is not ready on a commercial scale.